Explore the traditional towns and natural wonders of Western Australia on this action-packed 3-day adventure, including accommodation, meals and round-trip transport from Perth. Get a taste of typical Aussie life as you visit the towns of Busselton, Pemberton and Margaret River and watch a sheep-shearing demonstration. 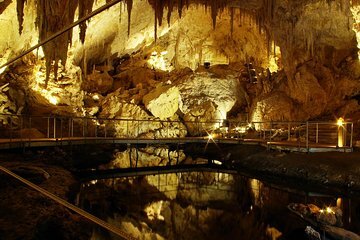 That’s not all: see landmarks like Mammoth Cave and Cape Leeuwin Lighthouse; enjoy a treetop canopy walk through the Valley of the Giants; and climb the ancient Gloucester Tree. I highly recommend this tour to who want to have a comfortable leisure holiday. This tour may not be the ideal for backpackers --- if you are looking for young travel mates this tour may not for you. But if you are after a well organised, nice accomadation, easy walk around but still want to see a lot, this tour is just awesome. The only thing which I feel a bit doubt is the tour stays one night at Kerri Valley Resort, don't get me wrong, this place is very good, but there is no signal at all, no wifi, no internet, no mobile signal...I have tried both Telstra and Optus mobile but no luck. Fantastic journey. If you have only a few days to get out of the city to see some of West Australia this is a good choice. This Adams tour was good. The 2 drivers we had were excellent drivers and very informative. The accommodation and food was very good. BUT the only problem was that we booked through Viator and apparently although their site had updated the current prices for this tour they had not updated the current itinerary details. Therefore the tour was actually different to the itinerary we had and the end of tour pick up times were incorrect.